I bought a used Imiev 2012 odometer 1,200 miles. original tires the steering is notlike normal power steering. doesent pull. , but when I make a small correction it keeps going until make a correction in opposite direction. I didn’t notice that my iMiev handled any differently than other cars I have driven. Might be worth having it checked. snookpig, welcome to the forum. A 2012 with 1200 miles on it!!! Gosh, I wouldn't expect any suspension wear at all. Regarding your issue, in addition to what Don said, what you describe also sounds like underinflated rear tires. First make sure that the tires are inflated correctly (36psi) or even overinflated slightly - primarily to ensure good mileage. What you describe is also a normal response when driving on longitudonally grooved pavement commonly experienced on Interstates, and is the result of zero toe-in/toe-out which the car is set to in order to minimize rolling resistance. The electric steering on the car is excellent, but does 'feel' just a little bit different if you've not experienced it before. While you're checking things, I presume that the 12v battery has been replaced, but it wouldn't hurt to do a load test on it just to make sure it's up to snuff (especially as it's now winter). Even though it doesn't experience a serious load such as seen with an ICE (Infernal Combustion Engine) vehicle, a weak 12v battery has been the source of a lot of strange issues with our cars over the years. Good luck to you with your new car, and hope you're experiencing the EV grin! That is not normal operation, but it sounds normal for a car that has been sitting a long time. 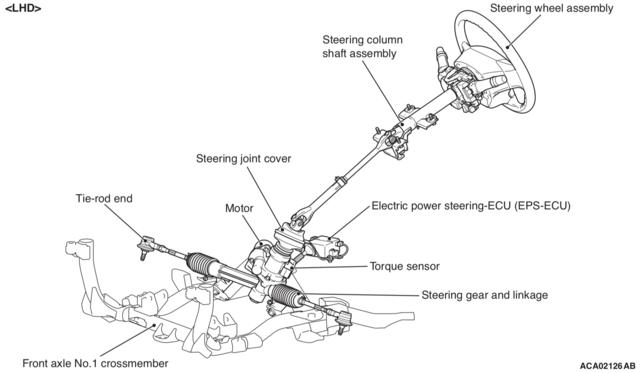 With such low miles it could be rust, corrosion or debris has built up either in the steering rack and pinion, the electric-assist motor/gearbox, or in some of the tie-rod ends such that it is causing it to be very stiff and bind. It may clear up over time with use, or you could try jacking up the front end and exercising the steering. Don explained more about alignment that I ever could. # Several (at least two of us) got new MiEV's delivered with the front wheels toe set not quite correctly. That COULD cause what you report. Perhaps worse, it can wear your expensive front tires quickly (unfortunately, I didn't know mine was out of toe until at about 18,000 miles notice the uneven wear. I'd say have your alignment checked anyhow. Les Schwab in my area will check alignment and may not even charge you if it either doesn't need adjustment or what's out of alignment is non-adjustable. # At least one of the settings (camber?) was reported to me by Les Schwab as not exactly set at perfect factory spec but as unadjustable on MiEV. I agree with others to have the alignment checked. My car was weirdly aligned (both wheels pointed to the right) but drove perfectly straight on the original tires. I'm not sure how these cars were aligned when they were built, but they seem to align it by feel (steering wheel straight makes the car go straight and that's all they look for). That said, my car will mostly self-straighten out of a turn. There's about 15 degrees of turn off of center that mine won't self-center, which I think is simply due to zero toe-in. Caster by itself can only do so much. Being that your car has so few miles, the aforementioned alignment and simply driving the car will help. I don't know if the linkage has any lubrication points.